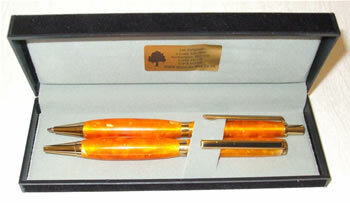 Pens are becoming very popular as gifts and keepsakes. They can be made from almost any type of wood be it fancy, exotic, natural, layered or natural. They can also be made from acrylic and resin based materials as seen here. 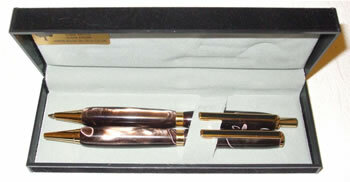 Many different styles are available, from the simple "Twist Top" ball point and click pencil, through to roller balls and fountain pens. 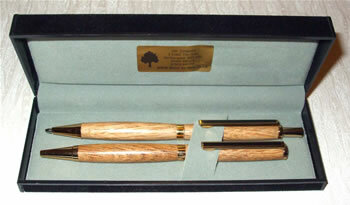 I was recently commissioned to make 2 sets of pens, but they needed to be engraved with initials. This is not the sort of thing I normally do, as my writing looks like a spider has walked through a patch of wet ink. 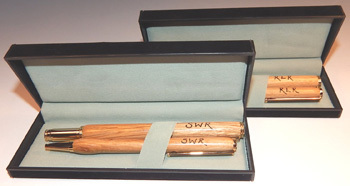 Fortunately, I have a contact that does pyrography very well, at a reasonable cost. She has done several items for me in the past, her work is always excellent quality and her charges are reasonable. 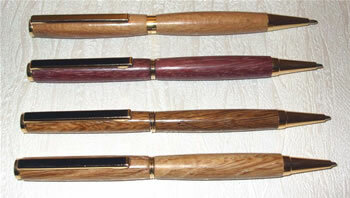 This selection of pens are made from Oak, Spalted Beech and Purpleheart. Any hard timber can be used, they look and feel great. 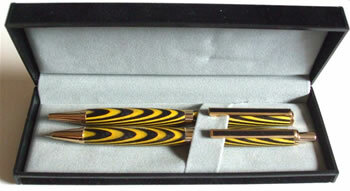 A Pen & Pencil set nicknamed "The Bumble Bee's"
This pen and pencil set was made for a very good friend. I have known Peter for nigh on 30 years, and I much appreciate the help he has given me during that time. Key rings are nothing more than a "short pen" in terms of construction and manufacture, and can be made in any shape, from the same range of materials.